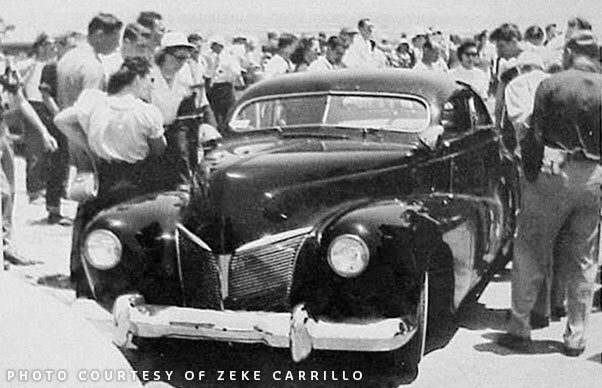 Gil Ayala’s 1940 Mercury Coupe Custom started out as Gil’s personal Custom Car. The car showcases all the things the Ayala’s were known for. He later sold it to Richard J. Stickley from Hollywood. 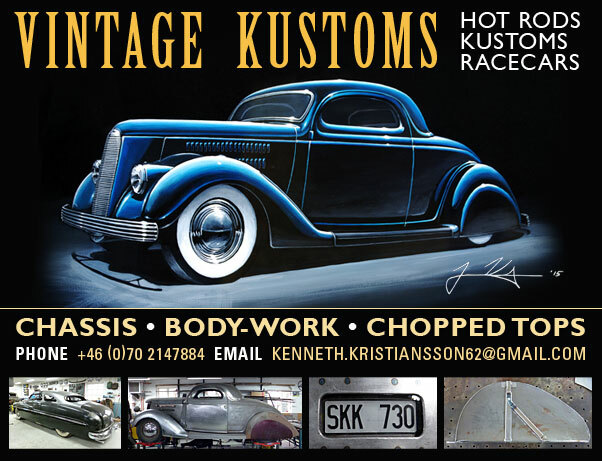 Gil and Al Ayala are known for their super smooth restyled Custom Cars. Wonderful blended body work with streamlined shaped front to rear. The car the two brothers created as Gil’s personal driver was a perfect sample for this. 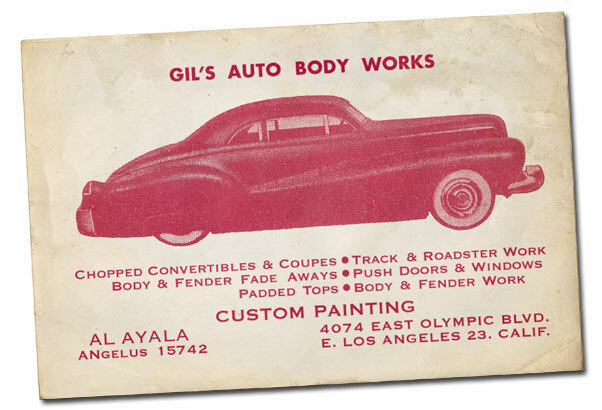 In fact they thought so them selves as well, since a side view photo of the car was used to advertise Gil’s Auto Body Work shop for several years, and was also used on the shop employees business cards. 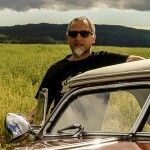 We have not been able to find out when Gil bought the car, and when he started to customize it. 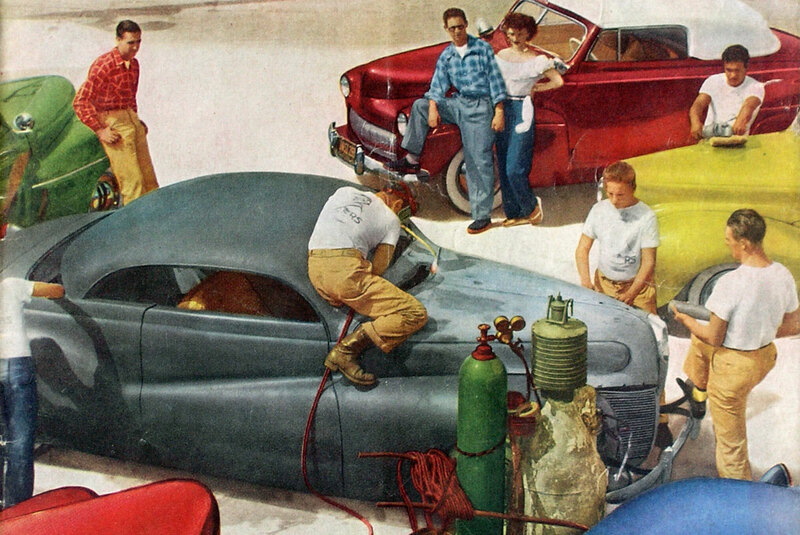 As far as we know the photo used on the cover of the October 1951 issue of Motor Trends magazine is the first photo taken of the car in progress. But we do not have a date when that photo was taken. According the “timeline” on Gil’s Mercury this must have been in 1949, since the car was finished in 1950, as it appeared in finished from on the November issue of Motor Trend on 1950. But the Wally Welch 1941 Ford can be seen finished in the top right corner having 1951 silence plate mounted. 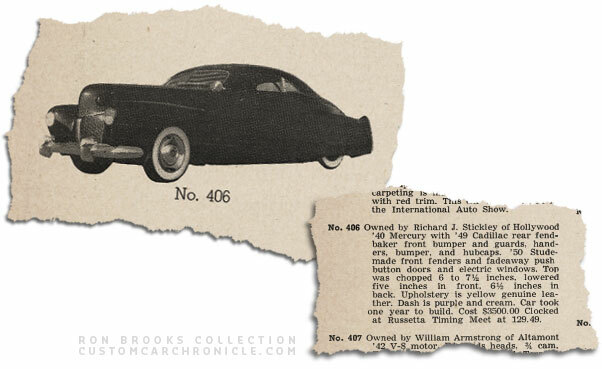 The 1950 Motor Trend magazine mentioned that car was finished on new years day in 1949. We know that the finished 1940 Mercury appeared on the cover of the October 1950 issue of Motor Trend magazine. We have seen at least two snapshots from the Wally Welch Collection that show the Mercury in its second form at Gil’s shop. Cars in those photos have 1950 tags on them. 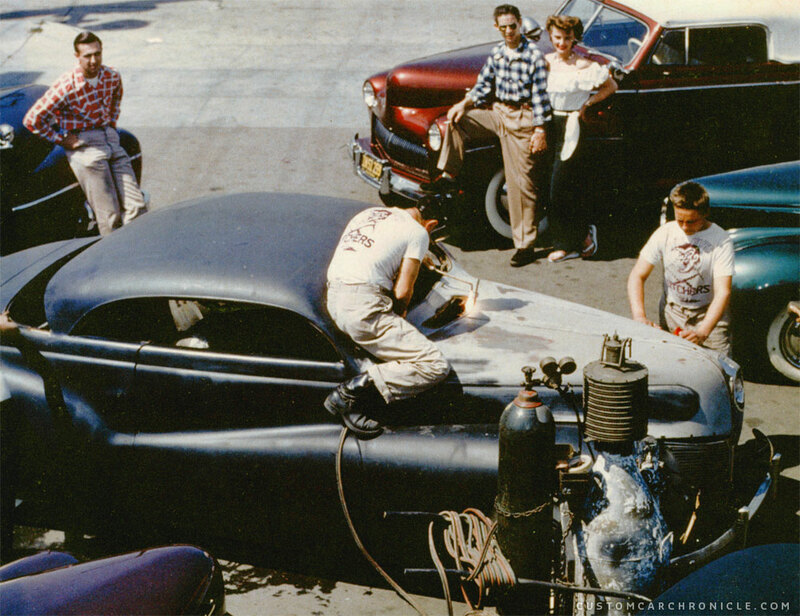 The one thing that makes is really strange is that Wally most likely took these photos while his 1941 Ford was being worked on. Although there is no photo of Wally’s 1941 Ford in progress with the finished 1940 Merc in the background. The finished 1940 Mercury appeared at the 1951 Oakland Roadster show held on Feb 20-25, 1951. The photo taken by Felix Zelenka that was used on the cover of the October 1951 issue of Motor Trend shows a finished 1941 Ford for Wally Welch with 1951 silence plates, in the same photo we can also see the Hank Griffith 1942 Ford. 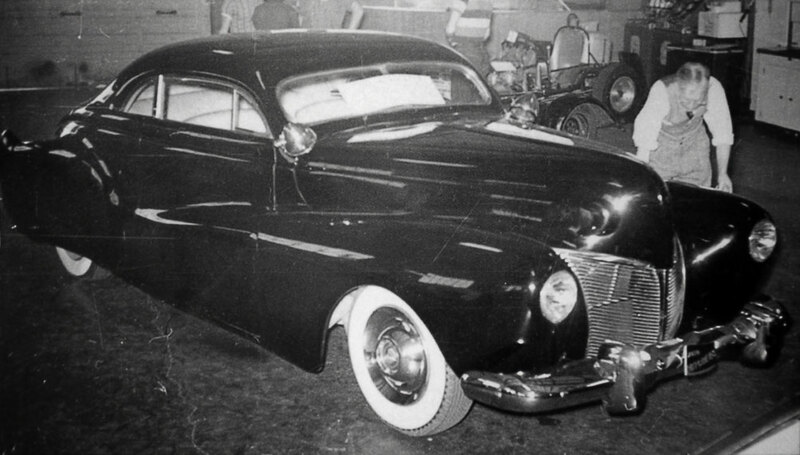 The Ayala’s used a set of 1950 Cadillac rear fenders as well as sections of the 1950 front fenders to create full fade away fenders. 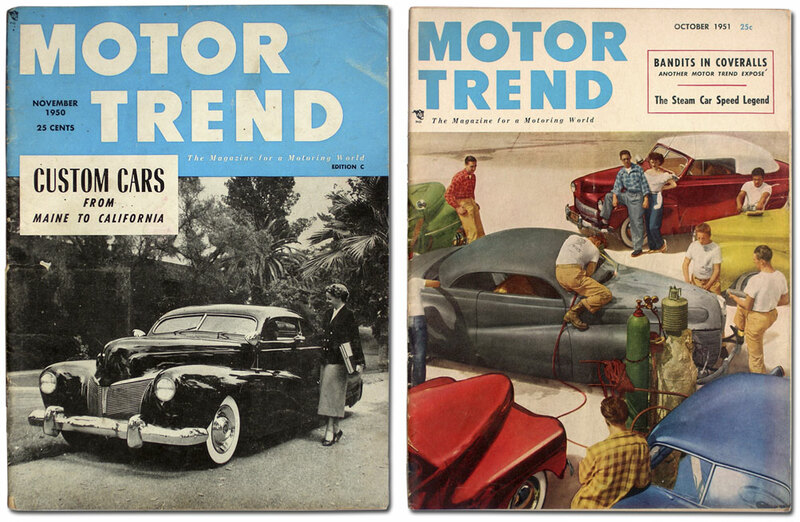 All this makes it very hard to believe that the Felix Zelenka photo on the 1951 Motor Trend cover was taken in 1949. As David Zivot pointed out, perhaps this is a second 1940 Mercury built with the same restyling as Gil did on his own personal Mercury? Or could it be that something happened to the Mercury and that a new top was added to the main body before Gil sold it to the new owner in 1951? 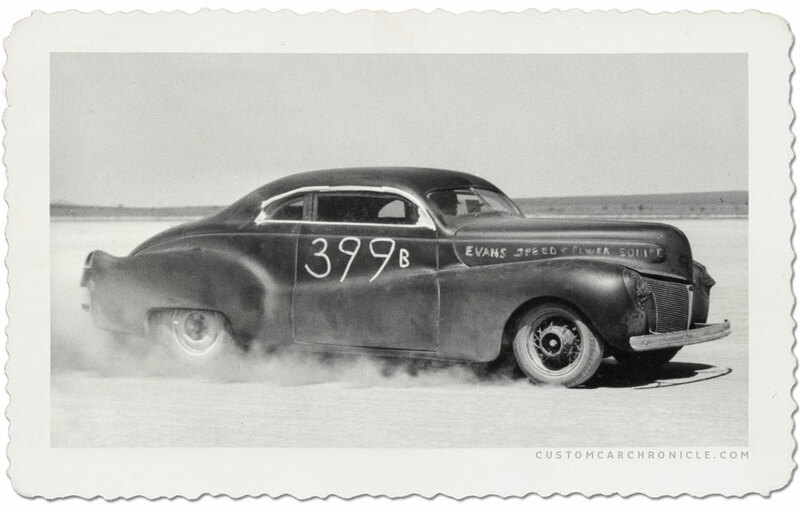 Pat Ganahl showed a photo of an chopped 1940 Mercury, in his excellent two part Ayala story in the Rodder’s Journal magazine (issues 39 & 40) that has a fade-away fend line drawn on the photo. In the article it is assumed that the photo was Gil’s Mercury. Which would make sense, but at the same time does not make sense with the other photos we have of the car So it is a bit of a mystery where this photo is actually Gil’s Mercury, or most likely not. Gil’s Mercury was photographed for the Motor Trend issue with the full fade away fenders all finished on a primered body and the chopped top unfinished. 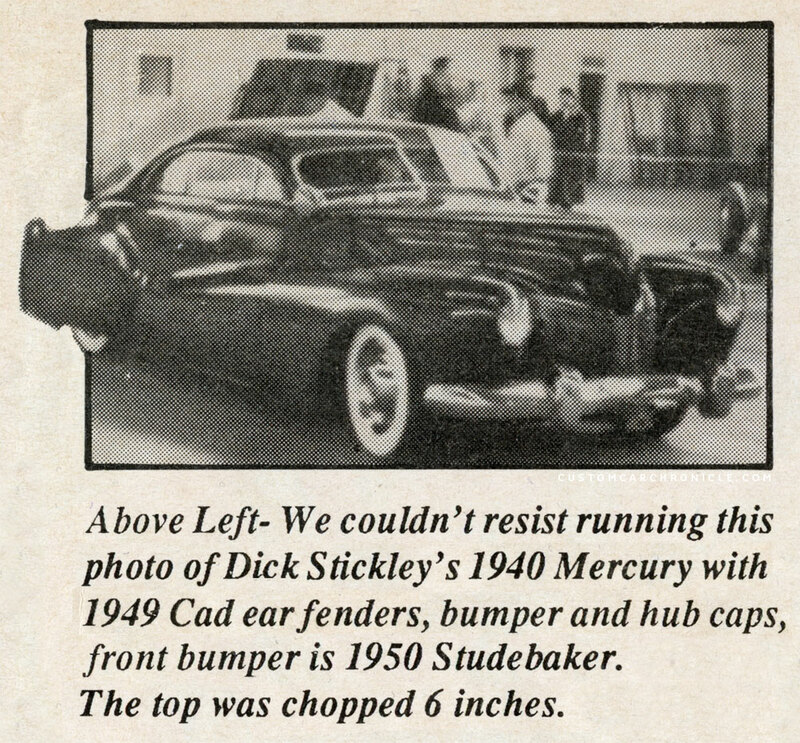 In this photo the whole rear section of the top still needs to be done, while the snapshot Pat showed shows a completed chopped Mercury with no fade away fenders. 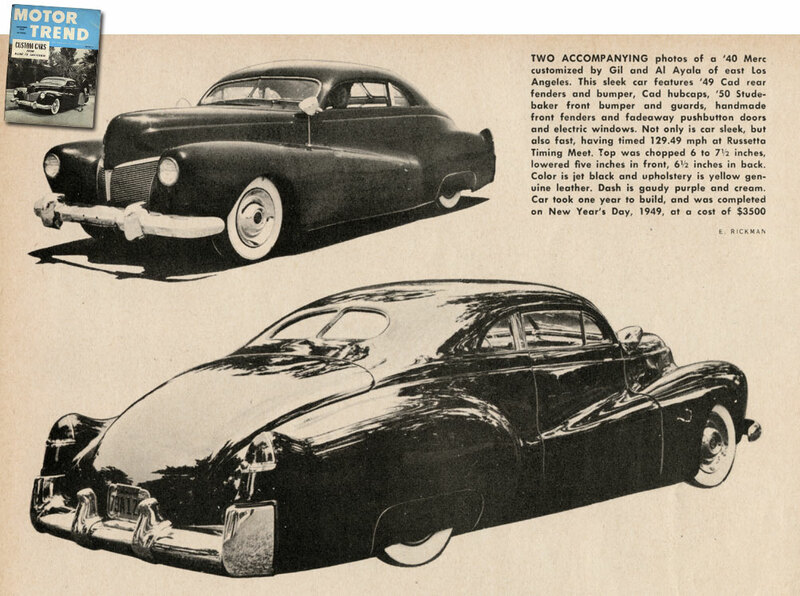 So I assume Gil used a photo of another custom 1940 Mercury project he had done to draw the lines of his personal 1940 Mercury project on. Or was it his own Mercury and can we see a different similar styled 1940 Mercury on the cover of the October 1951 MT issue. 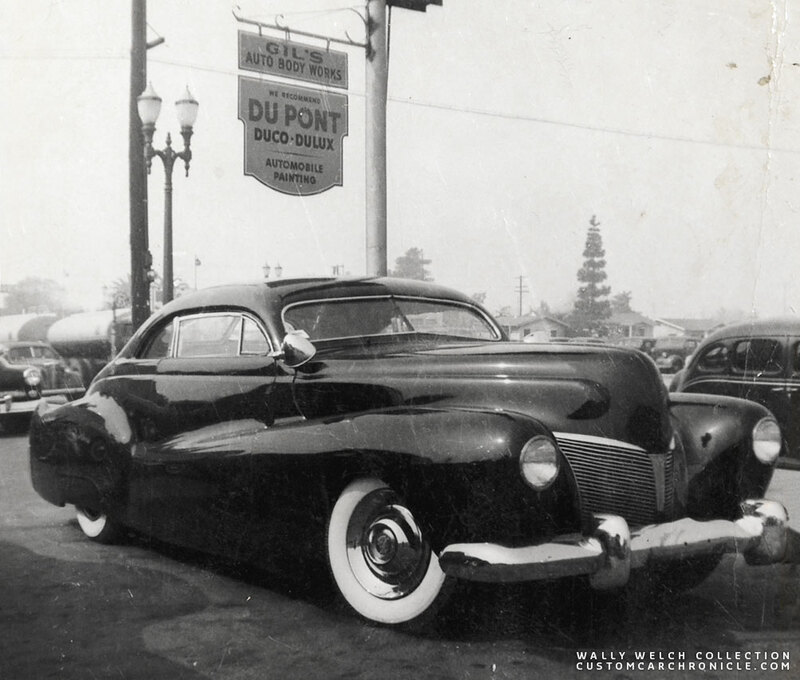 The photo Pat Ganahl showed in his two part Ayala story in the Rodder’s Journal from the Ayala Collection shows a chopped 1940 Mercury with a finished chop, but no fade away fenders. The worn snapshot shows a drawn line on the body where the fade away fender and the Cadillac fish tail rear fender would be on Gil’s personal Mercury. The windshield is also opened up with a drawn line. 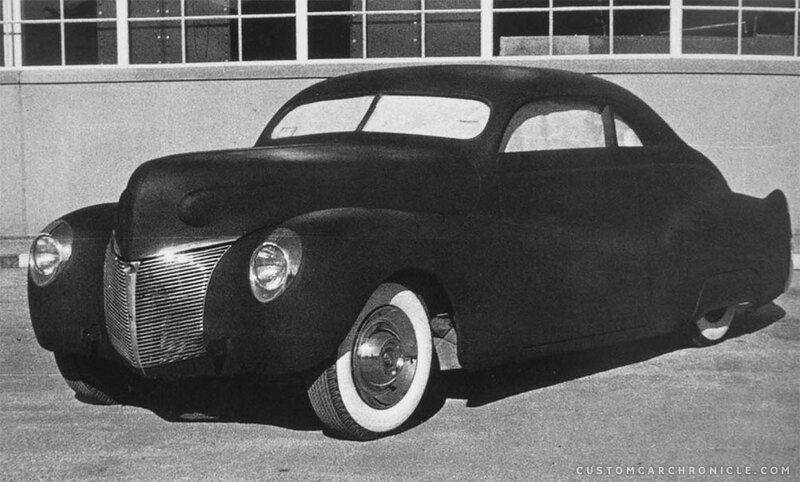 Like most Custom Cars back then, Gil’s 1940 Mercury was an in-progress driving project. And as we can tell based on the photos, it looks like there where three versions of car. Version one as it was “finished” in primer, Version two was when the car was finished in jet-black paint. And the last known version was when the car was painted Devil Maroon for the new owner. 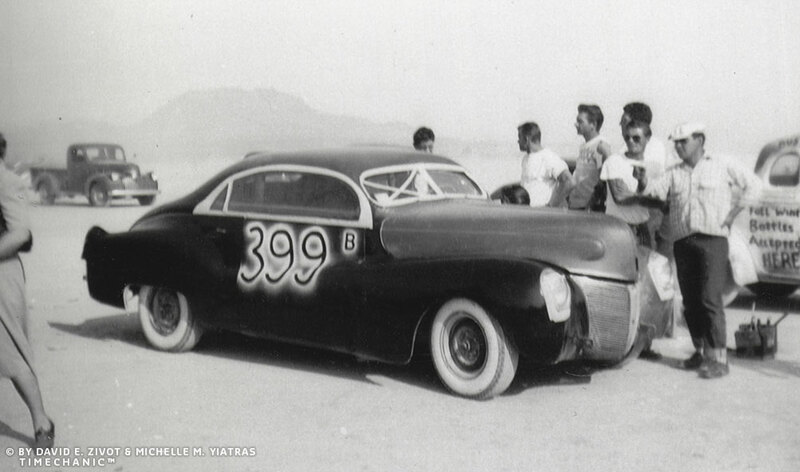 We have been told that most of the body work on Gil’s Mercury was done by Al Ayala, who was the body man of the team. 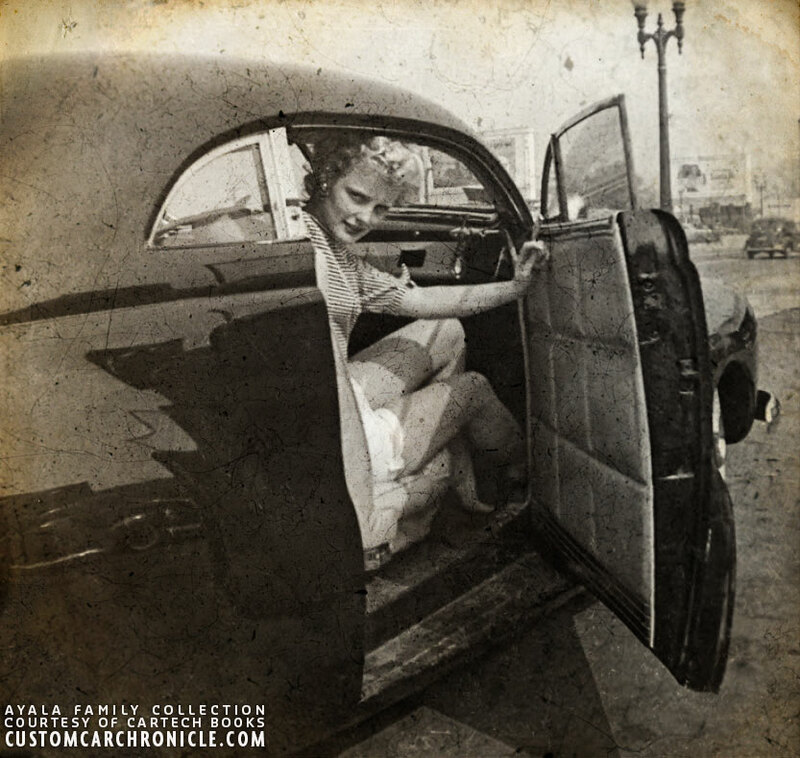 The 1950 Motor Trend magazine mentioned that the top was chopped 6 inches in the front and 7 1/2 inch in the back. The windshield was chopped less and raised up into the top preventing the mail-slot look and also preventing the top to look to heave compared to the windshield opening. 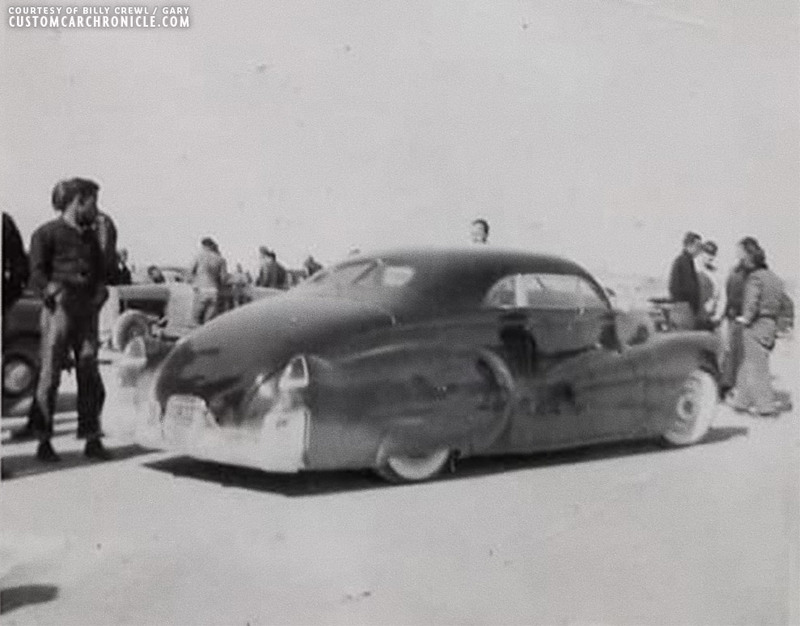 It is possible that the Ayala’s did this trick prior to the Barris shop who first performed this on Nick Matranga’s 1940 Mercury finished in 1950. For the rear of the top Al used shaped panels to make the top flow nicely into the the trunk. 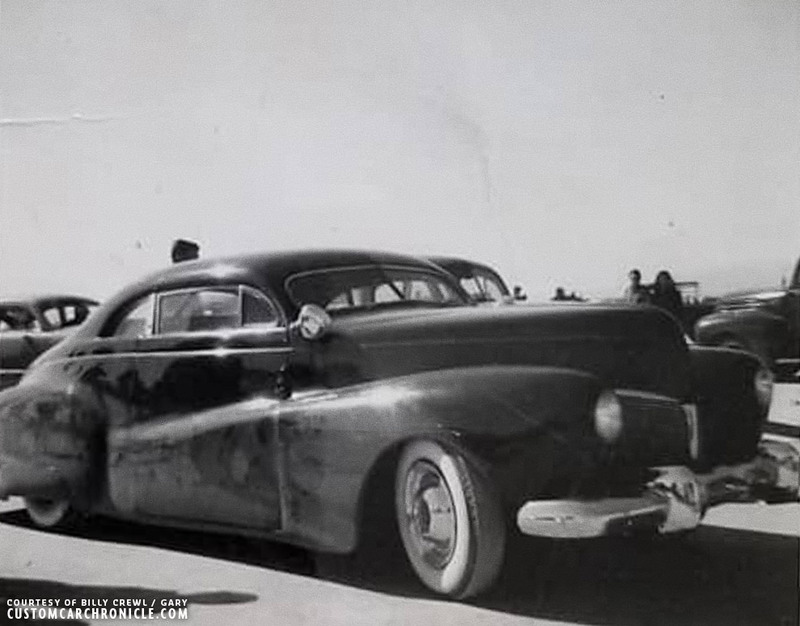 The most striking modification on this custom is the full fade away fenders, blending into 1949 Cadillac rear fenders. The Cadillac rear fenders were modified to fit the Mercury body. The front section of the Cadillac fenders sits far more forward than the Mercury units did on the body. The fenders were welded to the body and the transit leaded and smoothed in the typical Ayala way. The next step was the create the panels for the fade-away front fenders, which is not easy to do on a 1939-40 Mercury/Ford. The fenders are very round, and it is hard to create the shape in such a way that it still looks good at the back where it meets the rear fenders. But Gil and Al did an absolutely great job on it. The fade away starts at the top of the fender, so most likely the whole rear portion of the fender was cut off and pre-shaped metal panels were welded in place to create the fade-away fender section. The rear of the hood lower corner most likely had to be adjusted to fit the new fender line, and the door lines had to be recreated completely. Once the new panels where shaped everything was welded to the Mercury body and smoothed as it belonged there from the factory. At the back the stock Cadillac rear bumper was used below the stock 1949 Cadillac taillights. The new rear fenders with the tail fin and the fade-away front fenders had completely changed the looks of the car. Everything flowed wonderfully together. The body was shaved of all its trim and the handles were removed and replaced by push-buttons. The windows where changed to electirc operated units. The car was lowered 5 inches in the front and 6.5 inches in the back. For this version of the car the front fenders remained stock as well as the headlights and the front bumper was replaced with a 1941 Ford unit. 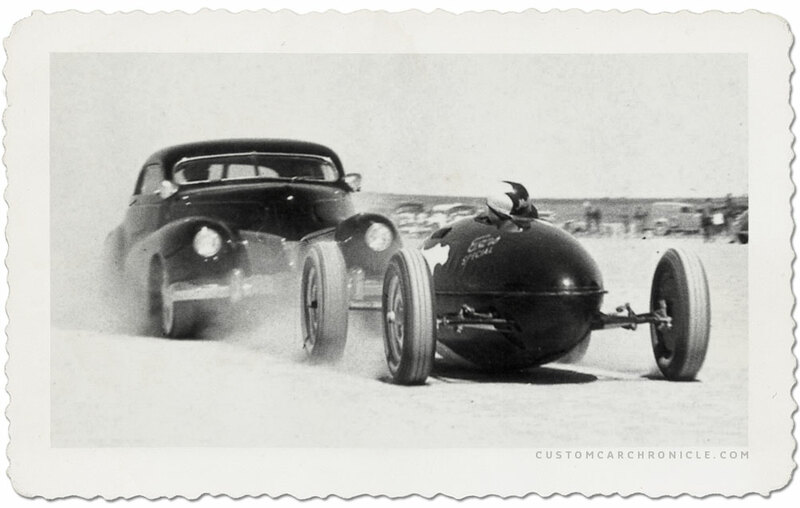 We are not sure if version was actually planned as a finished version, or if the car was put in primer so that it could be used on the road and the dray lake races while waiting for Gil and Al to have more time to finish the car. Gil Ayala was a menmber of the Rossetta Outsiders Car Club and raced the car at the Russetta meets at least during two events when the car was still in primer, and when the stock headlights were still on the car. Even though the body must have been very heavy with all the leaded in body work, Gil managed to get a top speeds of 127.11 mph with the 297 cubic inch engine. Earl Evans had built the engine for Gil using Evans heads and three carburetor intake manifold with an Smith & Jones cam. 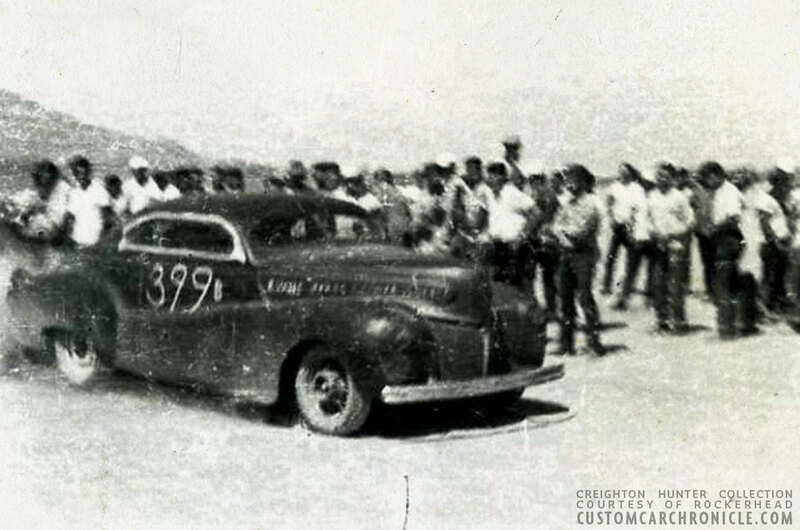 We have never really find out why the Gil ran spoked wheels on the front of his 1940 Mercury at this Rossetta meet. Perhaps it was just something that he had handy. The car is completed in primer in its first version in this photo. This kind of fuzzy, but interesting photo was shared by Rocherhead on the HAMB. The photo comes from the Creighton Hunter Collection. 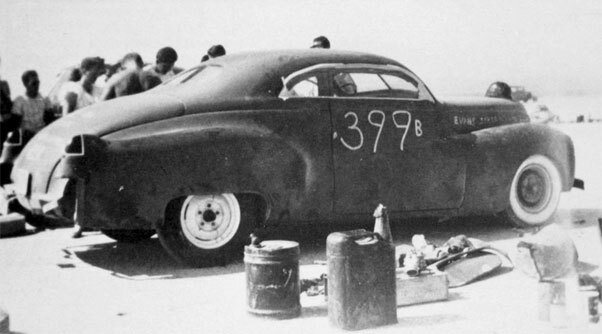 Creighton mentioned that this car amazed everyone that day when it turned a 129 mph speed at a Russetta Lakes Meet. We did not expect to see a custom car that was that fast. The picture quality is poor but I wanted to include here anyway. Note the number of hot rodder’s near the car which looks as if it is starting a run toward the traps. This photo from the David E. Zivot Collections shows Gil’s Mercury as another dry lake event, most likely also at an Russetta event. The car has the same number as the other photos, but are done differently now. The taped of windows are also different, better done, and the front bumper has been removed to save on weight. This photo shows Gil’s Mercury with a fresh coat(s) of primer in its first version with the stock headlights still in place. 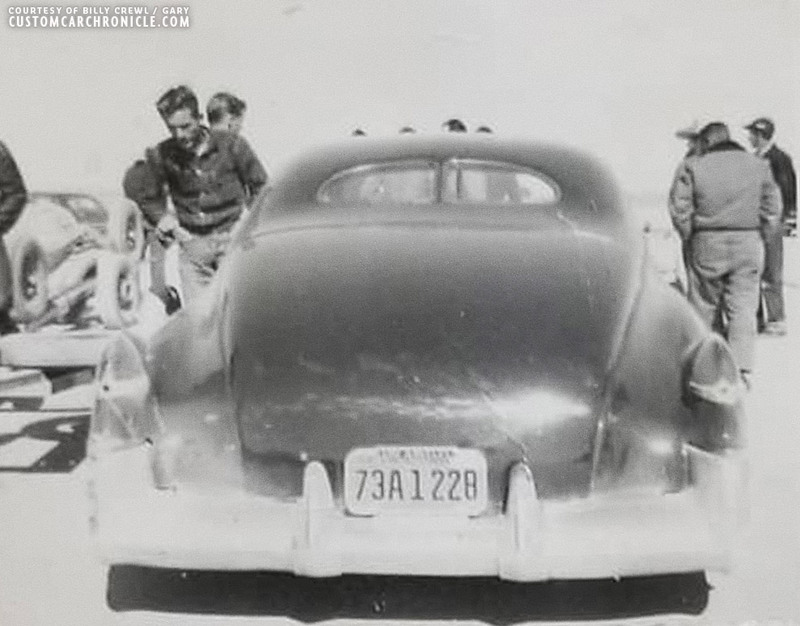 The car had a full set of white wall tires and Cadillac Sombrero’s mounted. It also appears that the hood had its handle hole now filled on the front. The handle hole was still visible on the dry lake photos. Some time later Gil and Al changed the front end of the car. Unknown headlights and possibly donor car fender sections or hand made units where grafted onto the Mercury front fenders. The front fenders now looked much more like a modern car from the time it was built, 1949-50. The 1941 Ford front bumper was replaces with an 1950 Studebaker Commander front bumper. It was then time to paint the car. Gil knew that the body work Al had performed was absolutely perfect, so he decided that jet black would be the perfect color to show of the fabulous body work the Ayala shop was capable to do. At this point a set of Appleton S-522 Spotlights was mounted. The interior of the Mercury was done in yellow and cream leather, along with gaudy purple dash and garnish moldings. I would have loved to see a color photo of the mercury in this version. 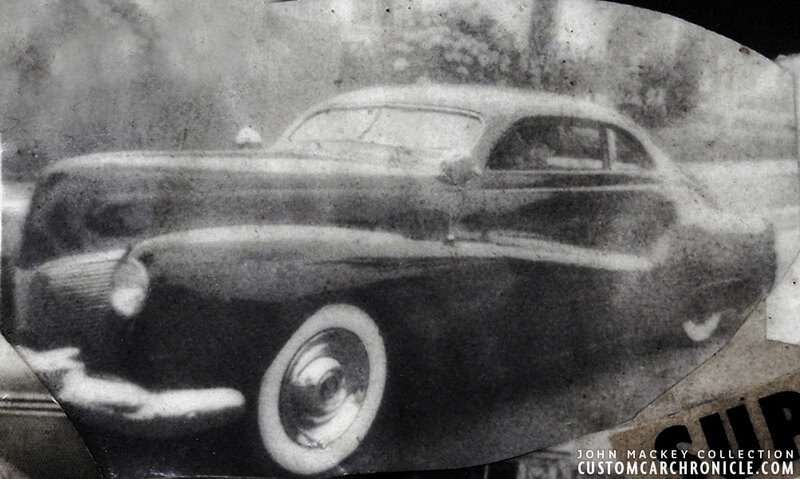 This snapshot comes from the Wally Welch Collection and shows the finished and jet-black painted Mercury parked at Gil’s Auto Body Works in 1950. Notice the super straight reflections on the front and rear fenders, all due to the perfect body work of Al and painting skills of Gil Ayala. Great photo shows the very unique interior upholstery done in yellow and cream square-pleated leather. According to the CarTech / Pat Ganahl book Hot Rod Gallery II book the girl in the car is Jeannie Chrisman (Wally Welch his girlfriend at the time). To see this image and more interesting info please get a copy of Pat Ganahl’s Hot Rod Gallery II book. Eric Rickman took the photos for the 1950 Motor Trend magazine cover and inside. Not the best quality photo, but since there are so few photos of Gil’s Mercury known, I wanted to include it here anyway. This photo is part of a collage created from photos from the John Mackey Collection. The finished Mercury at one of the dray lake meetings. As the photo shows the car was very much liked by the crowd. Evans Belly tanker pushed of the line by Gil Ayala’s 1940 mercury custom. It appears that Gil Ayala is sitting inside the Mercury when this photo was taken at the Motor Trend photo shoot. This rear 3/4 view shows the really great flow of all the new body lines and how the use of the Cadillac rear fenders and fade away front fenders updated the car and make an ten year old car feel like a new car again. 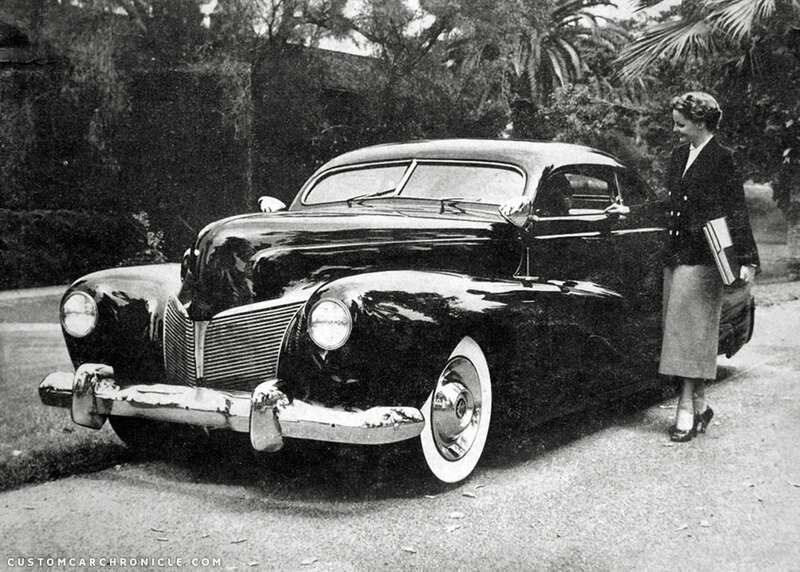 The last known version of Gil’s 1940 Mercury is when the car was sold to the new owner Richard J. Stickley of Hollywood, California in 1951. Most likely by the owners request the car was repainted in Devil Maroon. This version of the car was entered at the Oakland Roadster Show in February 1951, where it took first place in the custom class. After that show we have not been able to find any information about the car. Non of the publications we know showed anymore new photos of it, nor have we found anybody who can remember seeing the car at local events or national shows. It looks like the car completely disappeared. We also have not been able to find out anything about the new owner of the car Richard J. Stickley. Photo taken at the Urich Motors Shop in Whittier in California shows the car when it was most likely repainted in Devil Maroon. By now the front bumper has the Auto Butcher’s plaque added. We have only been able to find two photos showing this plaque with the car. This one, and the one taken at the 1951 Oakland Roadster shows shown below. Photo taken at the 1951 Oakland Roadster show. The car was painted Devil Maroon when it appeared at this show. This or the photo above is the last known photo of the Mercury we have been able to find. From the 1951 Oakland Roadster Show program. Gil’s Mercury was never really properly featured in the magazines. Major reason for that was that it was an early custom, and the real Custom Car and Hot Rod magazines had not come out before the car had disappeared from the scene. However Gil did manage to get the mercury on two magazine covers, not bad. Both on Motor Trend magazine and especially the second time the magazine cover in full color much have had quite some impact. The first time, November 1950 there where two more photos of the car inside, but the second time nothing of the Mercury was shown inside the magazine. Gil’s 1940 Mercury appeared twice on the Motor Trend magazine cover. First time as finished in jet-black on the November 1950 cover on the left, and in primer with unfinished, or perhaps with a redone chop on the October 1951 cover on the right. Motor Trend November 1950 double cover issue. 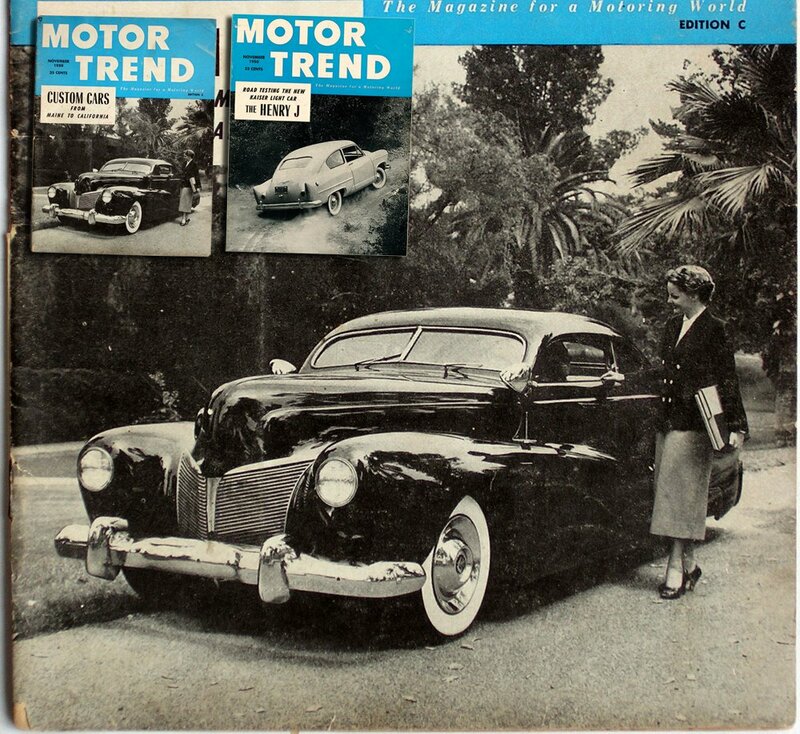 This November 1950 Motor Trend cover with the Gil Ayala 1940 Mercury on the cover is a rather rare magazine. As can be seen on the cover, on the top right it reads “Edition C”. As far as I have found out, the Mercury was used on the cover of the magazine distributed to California only. The Rest of the US/World had a cover with a Henry J on it, as can be seen in the inset. The cover and the description about the cover photo on page 5 is the only thing different on the inside of these magazines. So if you ever come across one with Gil’s Mercury on it you better get it. Despite being on the cover the inside only showed two photos of Gil’s Mercury an a short description. This was the biggest feature on the Mercury it would ever get. The side view photo of the Mercury taken at Gil’s Auto Body Works location was used in several ads during the 1950-51 period. Most of them showed the Mercury set free from the background, but at least one shows the house of Chrome building in the background. Notice that all Custom Work was Guaranteed! The same side view photo was also used for the Shops Business Cards. 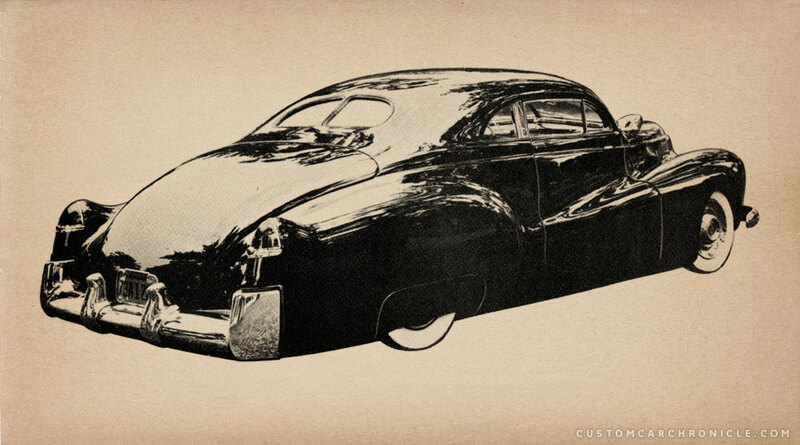 If any of the CCC-readers know anything more about Gil Ayala’s 1940 Mercury with fade-away fenders. 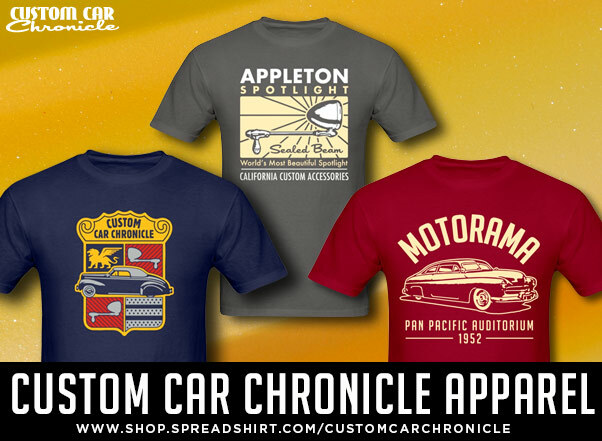 More info on the early years of the car, or perhaps what happened to it after the 1951 Oakland Roadster show, or any other info, please let us know, we would love to add any new information to this article to have it as complete as possible. Email Rik Hoving. Great article Rik! I love this car and pretty much everything the Ayala’s did. They didn’t get the recognition they deserved but man they turned out some incredible cars!! I would love to see a colour picture of the interior as well I think it would have been wild with the yellow and purple. This Ayala designed and built Mercury is a personal favorite. It took a certain amount of moxy to pull this off considering the elements used in the construction…Overall, it most definitely works well, and stands out as an example of superior craftsmanship and attention to the “Golden Mean”. I do have one question considering this particular custom’s build time-line. How could the car have been completed as of New Years Day 1949, when the cover of the Oct. ’51 Motor Trend clearly shows Welch’s ’41 ford bearing 1951 Cal license plates? 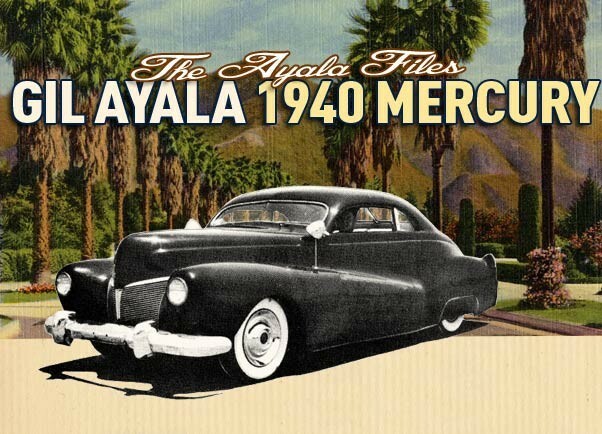 The Ayala ’40 Mercury is very far from complete as of that photograph. 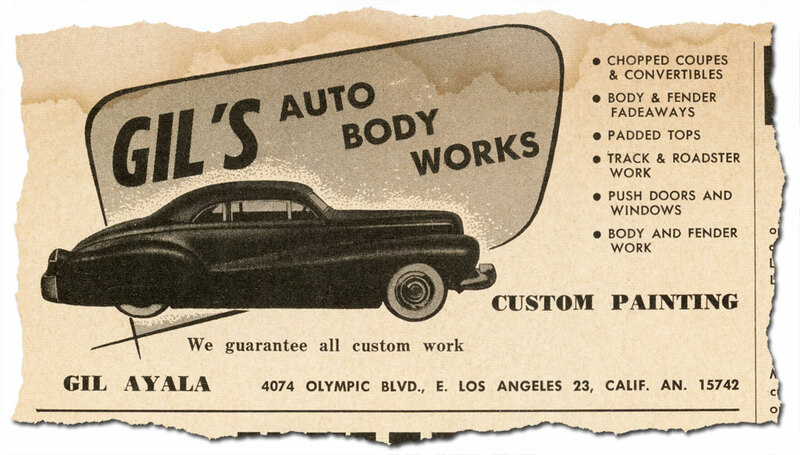 Even accounting for the short lead time on vehicle license tag issuance during that period the Ayala custom could not have been done until at least early-mid Oct. of 1950…Then appearing on the cover of the Nov. ’50 Motor Trend in it’s final form?…It may be that Ayala and crew worked very fast. Maybe the Mercury in the Zelenka color photo is a similar Mercury, perhaps the one in the Ganahl provided photo. One last point, Nick’s ’40 mercury was definitely completed by late Sept. ’50 as it was displayed and most assuredly a hit at the Nov. 16th-19th Shrine Auditorium “Motorama”. Could be that Gil was influenced by George, Sam, and Nick on that front windshield treatment. Thank you David… more Mystery’s I have changed the article, since this was puzzling me for a long time as well, but your insight opened my eyes once again. Perhaps there where two identical 1940 Mercury’s. But perhaps there was just one, and the chop and possibly a few other things could have been redone in late 1950, early 1951 before the car was repainted Devil Maroon? Including a new top? To me that would make more sense right now that to think there where two identical Mercurys with full fade away fenders and 1949 Cadillac rear fenders. And both disappeared? I have asked Lynn Ayala to help solve the mystery. Hopefully she has some dates on her father photos that might help. To be continued. That’s one of my favorite too. heavy mods on a 40 merc, but still elegant. Thanks for the article Rik.